So this is a project i’ve been working diligently on for the past several weeks now for a class i’m taking this semester (which i absolutely love, the teacher’s really cool). 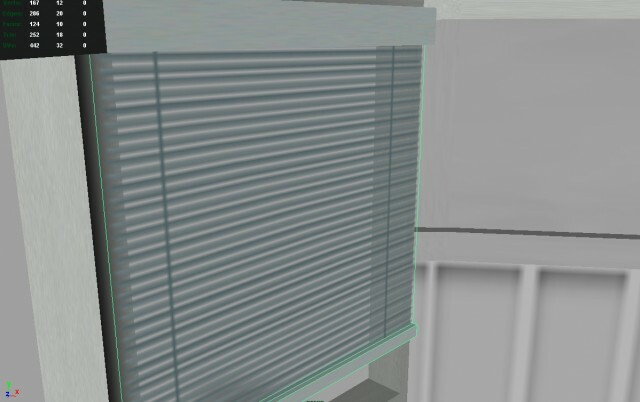 I made some blinds for my room, using individual faces/polys for each blind, making it really expensive. We’re modeling for video Games, so we need to minimize polys wherever best we can, so we can get spend the other polys for other objects we wish to make. Here’s what i had originally, “66 faces” for 1 set of blinds. So my teacher oh-so-awesome wisdom and experience tipped me off, saying i could easily achieve the same effect using a single plane, with perhaps an alpha map. He didnt exactly say how to do it, and me being so unsure of myself, didnt question more about it. I went on using my own guesstimates and have come up with a rather decent(i think it is! i’m soo proud of myself!! ) 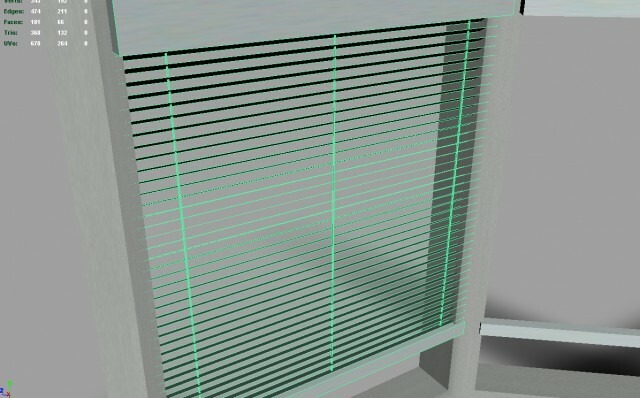 “new blinds”. This new and improved version uses only “10 faces” compared with the original’s “66 faces”. I’ve deleted the blinds and replaced it with a single plane, followed by hand-painting a blinds-texture in photoshop (weee! im an amateur at texturing/3d modeling so every little successful thing i achieve i get very excited and feel really proud about), together with an alpha map. So this is the new and improved blinds, with just 10 faces, still works pretty much the same way as the old one did. Please leave a comment or any other tip you have for me, better ideas/ways i can further improve my work. The only way i learn is by crashing-and-burning, so rip and flame me, i take it well.